So many of you corpse flower fans had questions about Alice’s bloom time and scent that I thought I’d give you a timeline and extra details about Alice’s big night and the day that followed. Over the course of 2 days, over 13,700 people came to see Alice the Amorphophallus; by the end of the weekend 20,000 people saw the bloom. Loving the “buzz”! 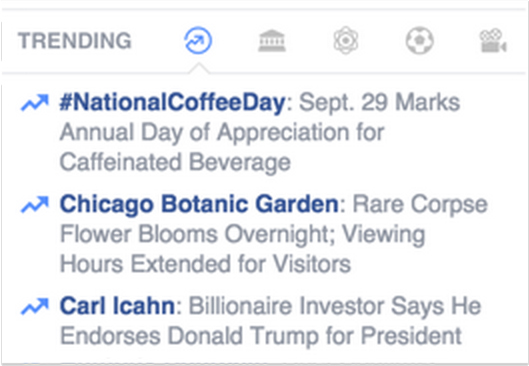 Did we surpass caffeine in popularity this evening? A short while after this screenshot was taken, we did. What a day, and what a week! 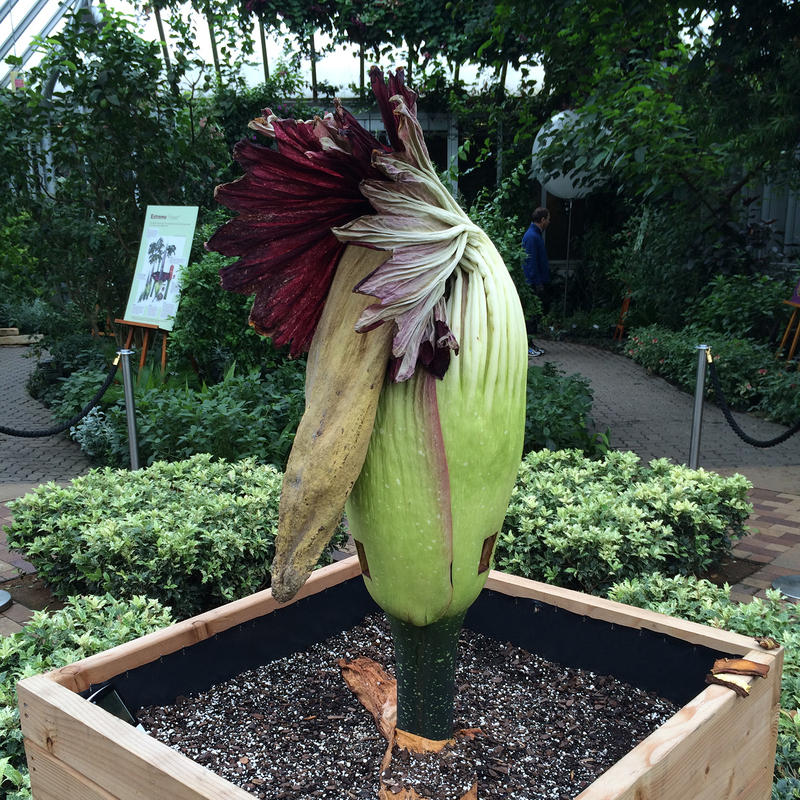 Alice the Amorphophallus took us all by surprise by beginning her bloom cycle late on Monday, September 28. We’d been expecting her to bloom around October 1, and had been watching for the telltale clues, just as we had with Spike in August. Alice’s two outer bracts had fallen away on the weekend, but she continued to grow. Pampered like a movie star and protected from direct sunlight this time of year with a beach umbrella, she enjoyed a cozy, humid greenhouse. We watered frequently and monitored Alice’s internal temperature, checking several times each day with the use of a new, forward looking infrared (FLIR) camera—a thermographic camera that senses infrared radiation—since the heating of the spadix (the tall spike in the middle) over 90 degrees Fahrenheit is a sure sign that bloom has started. Our precocious plant, however, decided to begin opening late at night! 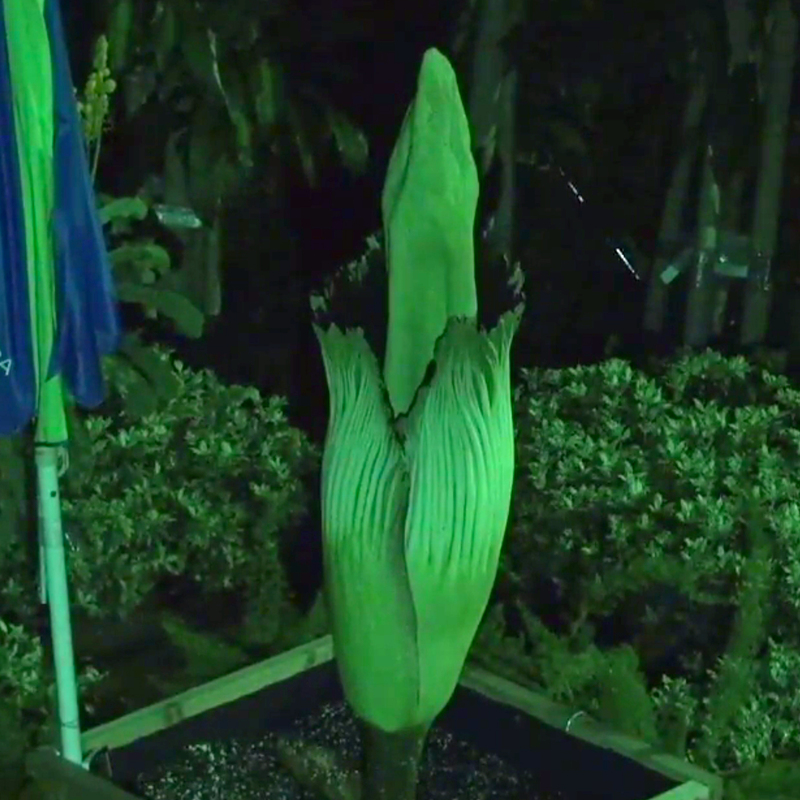 Around 11 p.m. Monday evening, it was evident that the spathe was pulling away from the spadix, and by 2:30 a.m., there was a noticeable smell—from outside the greenhouse. Alice was blooming. Alice the Amorphophallus in full bloom, around 8 a.m. on September 29, 2015. 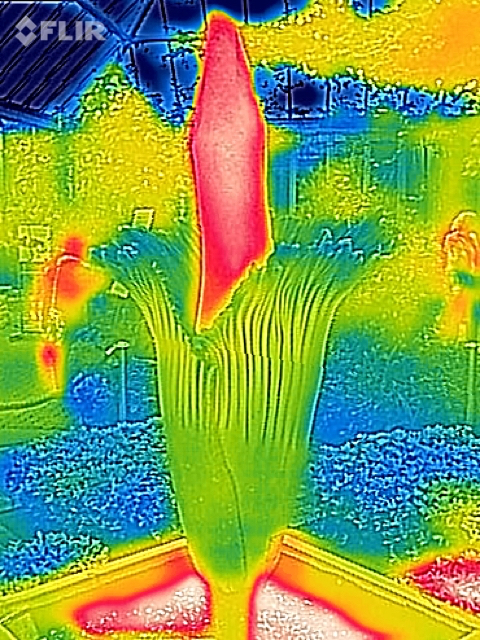 A thermographic image of Alice in bloom shows the spadix heating up. Monday, September 28, 11 p.m. — The spathe (a frilly modified leaf) begins to pull away from the tall spadix (flower spike); Alice’s internal temperature begins to increase to help volatize the odor to attract pollinators. Monday – Tuesday, September 28 – 29, midnight to 10 a.m. — This is the peak of the flowering period, when the strongest odor is produced. The odor is noticeable when entering the Regenstein Center and Semitropical Greenhouse. The spathe is most open during this time (to about 75 percent). The spadix temperature is at its highest point of 95 degrees Fahrenheit internally; the female flowers are receptive to pollinating at this time. 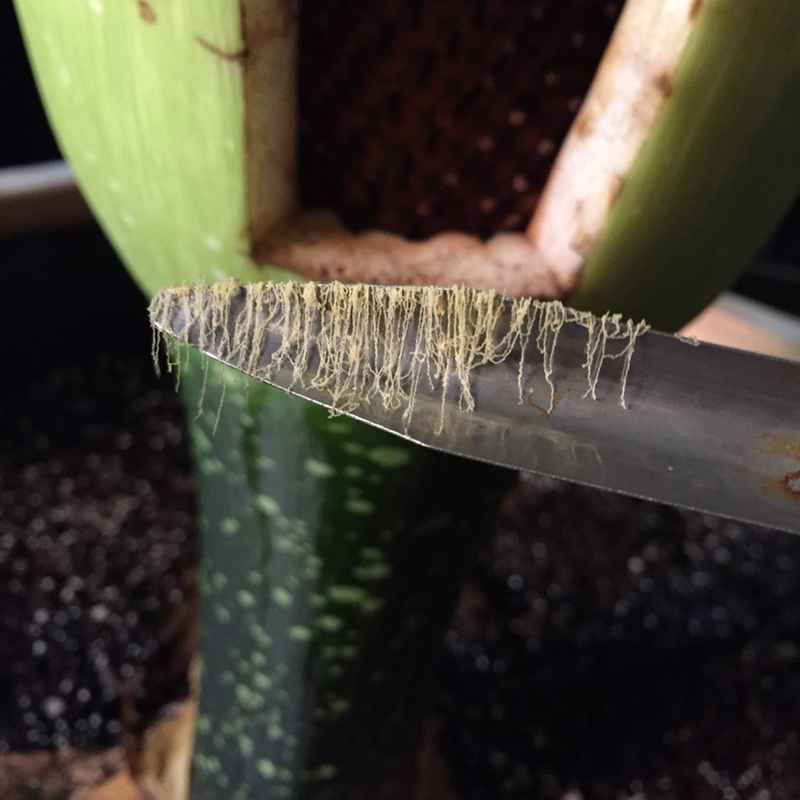 Tuesday, September 29, 8:30 a.m. — Small windows are cut open at the base of the spathe to perform the “manual pollination process,” using the pollen from Spike and donated pollen from the Denver Botanic Gardens (from a titan arum named Stinky). Tuesday, September 29, 10 a.m. to 3 p.m. — The odor begins to dissipate; it is only noticeable within 10 feet of the plant. Tuesday, September 29, 3 to 10 p.m. — The spathe begins to close up. The temperature of the male flowers increases to 87 degrees Fahrenheit to help ripen the male flowers to produce pollen (see photo above). Tuesday, September 29, 11 p.m. — Pollen is collected from the male flowers to save for future pollination of the other titan arums in the Chicago Botanic Garden’s collection and to be available to donate to other botanic gardens and universities, as requested. Wednesday, September 30, 6 a.m. to noon — There is very little odor, except within 2 feet of the bloom; the spathe is about 25 percent open. Thursday, October 1 — The spathe continues moving closer to the spadix; there is very little odor. Friday, October 2 — The spadix begins to soften and collapse, and the spathe withers. The plant diverts energy to continue the pollination process, as well as the development of fruit and, eventually, seeds. Monday, October 5 — The spadix has collapsed and fructescence (the developing of fruit after pollination) begins. Tuesday, October 6 —Alice moves back into the production greenhouses with the titan arum collection. Fruit will develop over the next several months. Visitors online enjoyed the scene as much as those here in the greenhouse. A 12-year-old girl, who’d come to see Spike four or five times (plus watched live on the webcam), came up to me and said, “I just had to come to Alice too! I’m so excited! And I couldn’t wait to meet Titan Tim! Can I get my picture with you?” My heart grew ten times larger right then and there. She was practically jumping out of her shoes, even after waiting more than two hours in line. She told me she’d just ordered a voodoo lily online (it’s a close relative of Amorphophallus titanum) and said, “I can’t wait for it to bloom, to smell it!” I knew in that moment I was speaking to a potential future horticulturist or botanist. 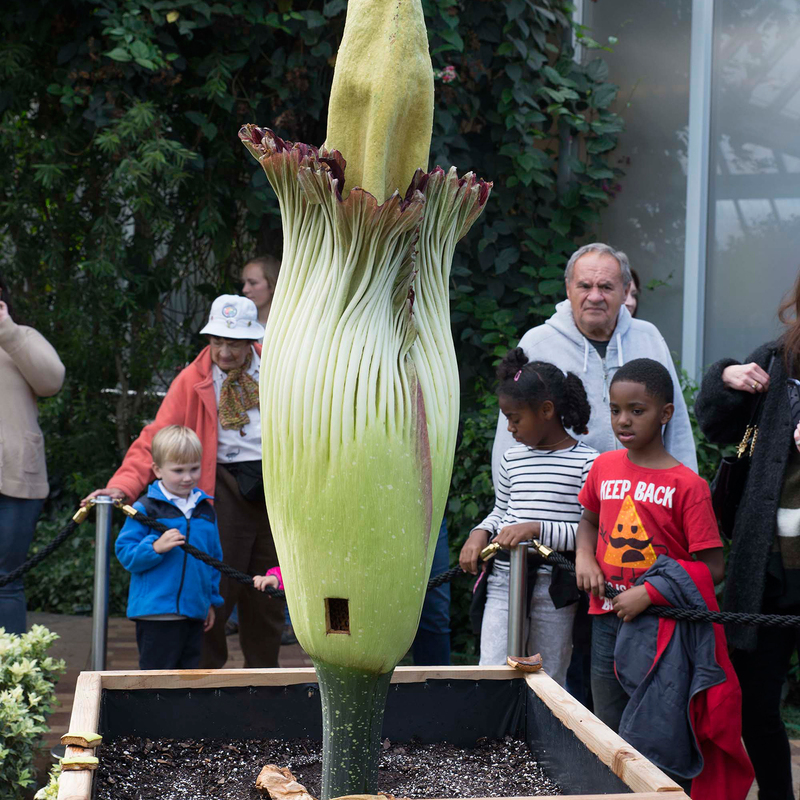 Did you have a flashback to science class when you saw Spike, the titan arum? I sure did. 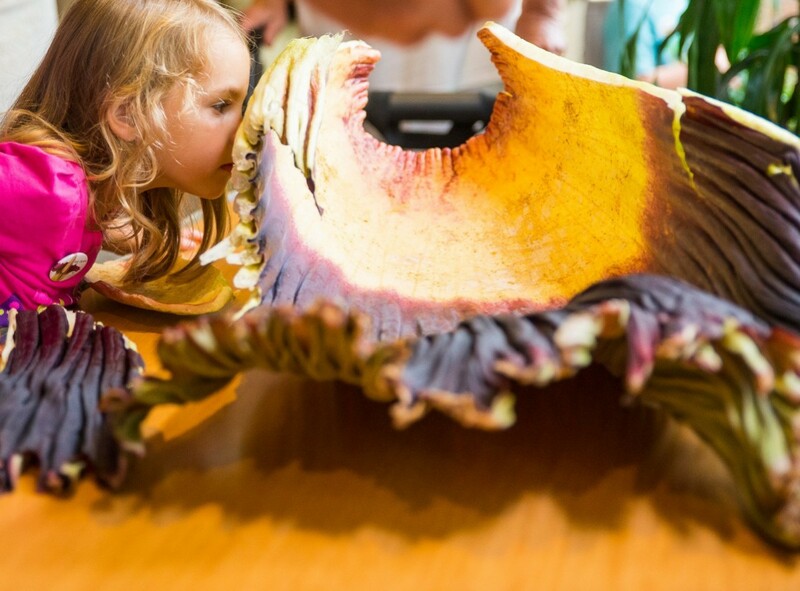 With Spike’s frilly spathe removed, Tim Pollak and Dr. Shannon Still had a rare opportunity to show the crowd the titan arum’s beautiful and astonishing inner plant parts. At my not-really-science-minded high school, botany (the study of plants) was taught as a subsection of biology (the study of all life) class. During the botany rotation, we learned a bit about plant names and plant parts, sprouted a few seeds, and dissected a plant. That was about it for my formal plant-science education. Hands-on plant science at the Garden: a young visitor gets a whiff of Spike’s removed spathe, looking for that telltale stench. Flash forward a couple of decades and, despite now being an avid gardener, I found myself struggling to keep up with the scientists who were looking deep into Spike’s structures and processes. By the time Dr. Shannon Still and floriculturist Tim Pollak removed the spathe (the frilly bract that never opened) from Spike’s spadix (the flower tower that grew to 6 feet tall), I’d had to learn all about the titan arum’s morphology (see below) and crack open books and laptops to review the basics about male and female flowers. And then they started talking pollen. Tiny squiggles of pollen emerge from the male flowers about three days after Spike’s spathe was removed. 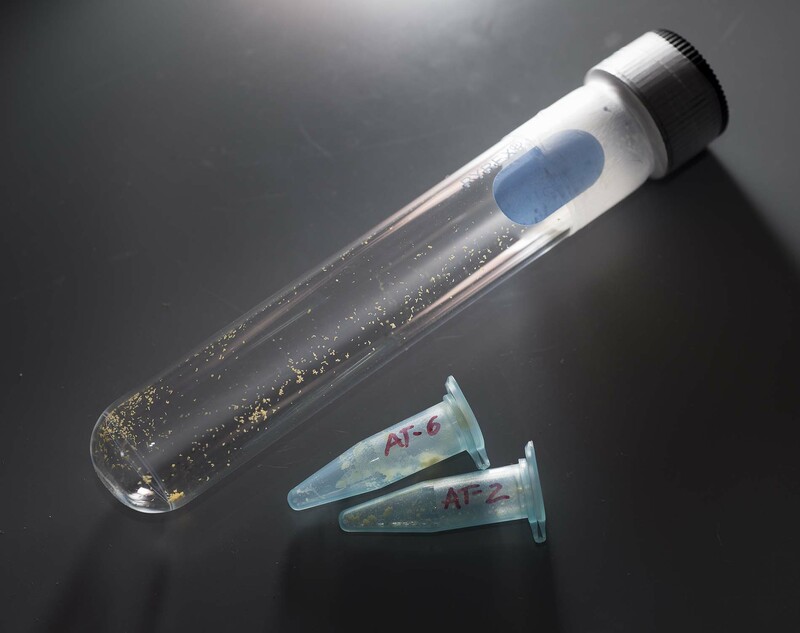 Think of a grain of pollen as a tiny packet of one plant’s genetic material that needs to meet up with another flower’s female genetic material. Technically, pollen is a haploid or gamete, the cell that carries the male half of the plant’s chromosomes. The covering of a pollen grain is directly related to how the pollen travels to the next flower. That’s why wind-pollinated plants like sweet corn or oak trees have pollen as dry and fine as dust (indeed, the word “pollen” derives from the Latin for fine flour or dust). Orchids have developed waxy balls of pollen (pollinia) that stick to the heads and bodies of the many insects, hummingbirds, and mammals they use as pollinators. And, notoriously, the pollen of ragweed is a tiny spike—the better to hold on to moist spots like the inside of human nasal passages, where the grains never germinate, but cause all sorts of sneezing and snuffling. Honeybee-pollinated plants (like many fruits, nuts, and vegetables) have evolved along with the bees themselves, offering up both nectar and pollen as food in exchange for the movement of pollen from plant to plant. Flashback: Why are insects pollinators? 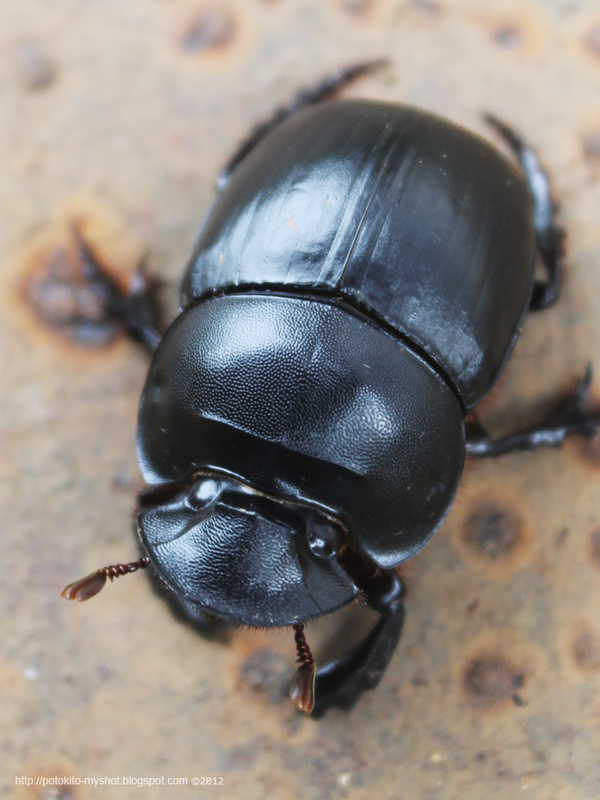 In nature, Spike’s pollinators are carrion beetles and dung flies—insects that would be attracted by the titan arum’s rotten smell and nighttime bloom. Flashback: How does pollen work? Dr. Shannon Still shows the crowd gathered around Spike one of the titan arum’s female flowers . When a grain of pollen lands in the right place—the tip of the female flower’s reproductive structure, called the stigma—the pollen grain chemically tests the landing ground via proteins that signal genetic compatibility…or not. If deemed to be a good place to germinate, the pollen grain sends a rootlike sprout down into the style (the tube with the stigma on top), eventually reaching all the way down inside the ovary and ovule…where the male chromosomes and female chromosomes meet for fertilization and seed development. Flash forward: What’s next for Spike? Spike’s pollen never got the chance to hitch a ride on a carrion beetle’s back to the next titan arum in the rainforest. That’s why “Titan Tim” Pollak collected the pollen when it developed a couple of days after Spike’s operation. Pollak says that they didn’t collect much of the bright yellow, talc-like powder—just a few test tubes’ worth (further proof that Spike ran out of energy). The pollen will be mixed with powdered milk—yes, powdered milk—in order to absorb moisture and separate the grains. Next, it will be frozen at minus 20 degrees Fahrenheit and stored in the freezer at the Garden’s seed bank. 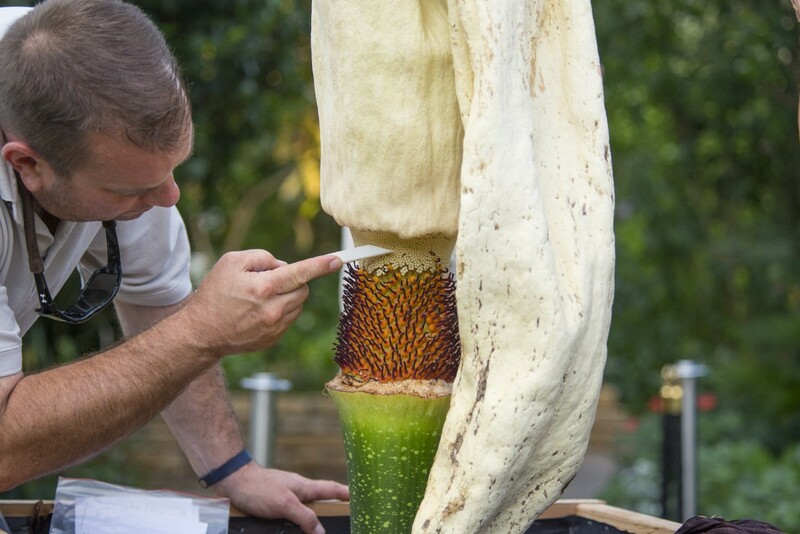 As the spadix collapses from age, horticulturist Tim Pollak harvests the pollen from Spike’s male flowers. Spike’s pollen could then be shared with other botanical gardens or arboreta that would like to pollinate their blooming titan arums. The American Public Gardens Association has a listserve that shares notice of pollen needed or available; the Chicago Botanic Garden is a contributing member. By sharing Spike’s pollen, the hope is to increase diversity among the rare flowers blooming outside of Sumatra, the titan’s native habitat. Pollen means that Spike lives on! Can’t wait for the next titan arum to bloom (we have seven more besides Spike in our production area)…and for the next plant flashback. So you want to be a plant scientist? An Amorphophallus titanum pollen sample is ready to be stored for future pollination. Arboriculture is the study of trees. BioInformatics is the art and science of recording biological information. Cellular biology is the study of cell constituents. Floristics refers to the geographic distribution of plants. Genetics is the study of gene interactions. Horticulture is the art and science of growing plants. Nomenclature is the naming of plants. Paleobotany searches out and examines plant fossils. Plant breeding does what it says. Plant morphology is the study of plant structures. Plant pathology studies plant pathogens and plant interactions. Plant physiology is the study of plant functions such as photosynthesis. Palynology studies both living and fossilized pollen and spores. Taxonomy studies the relationship of one plant to other plants. The night Spike blooms will thrill us all in the semi-tropical greenhouse, with its breathtaking flower…accompanied by a titanically rotten smell. 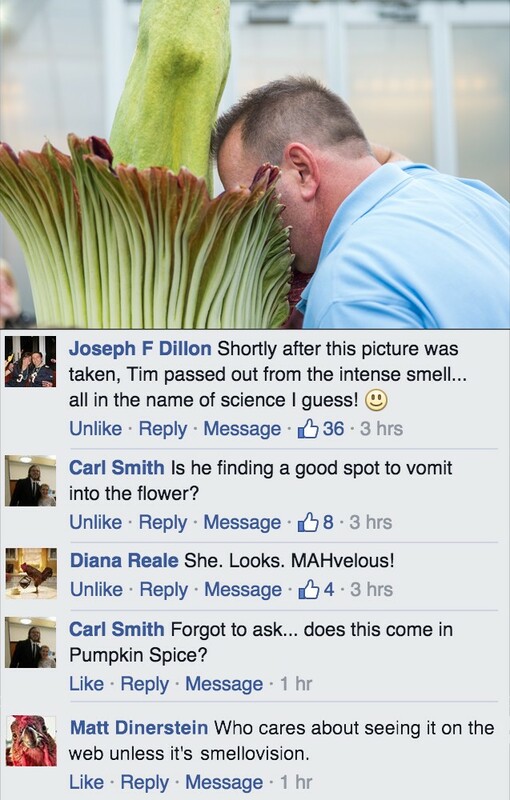 “Titan Tim” Pollak here once again, with an update on Spike, our still-growing titan arum. Spike continues to get bigger, not only in height, but also in girth! What we’re really curious about, however, is the aroma. The stench is one of the cool reasons to stay up late and come to the Garden that night—we’ll be open from 9 p.m. to 2 a.m.
What an “arum-atic” combination of scents! 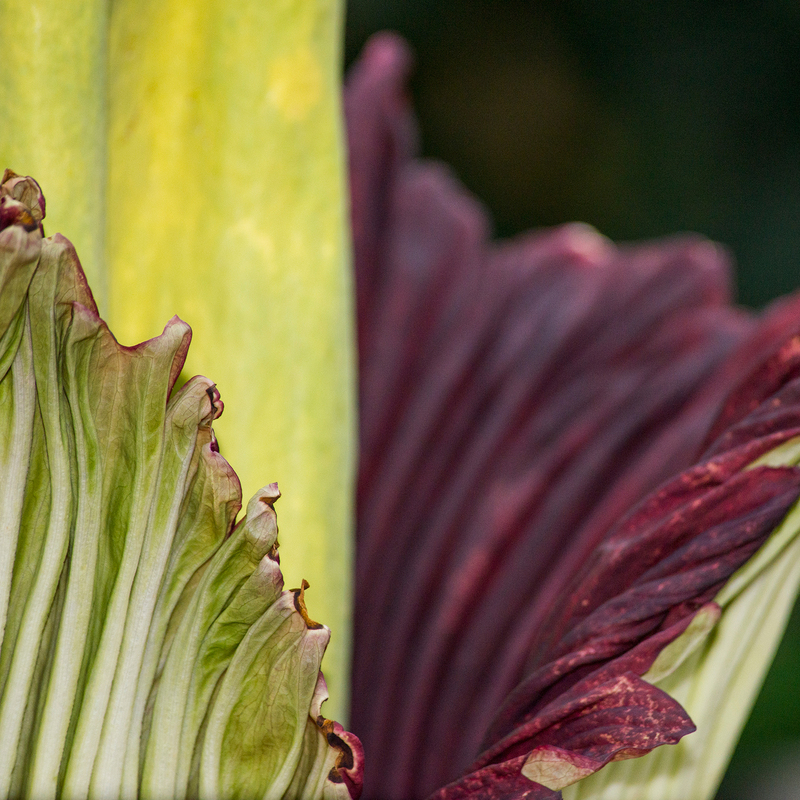 As the spathe gradually unfurls, the spadix releases powerful odors meant to attract pollinators. The potency of the aroma gradually increases from late evening until the middle of the night and then tapers off as morning arrives. 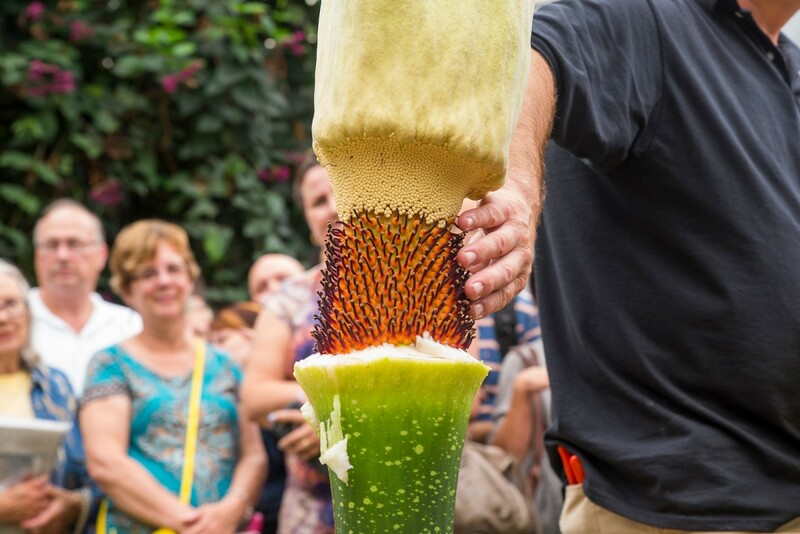 Analyses of chemicals released by the spadix show the “stench” includes dimethyl trisulfide (like limburger cheese), dimethyl disulfide, trimethylamine (rotting fish), isovaleric acid (sweaty socks), benzyl alcohol (sweet floral scent), phenol (like Chloraseptic), and indole (like mothballs). 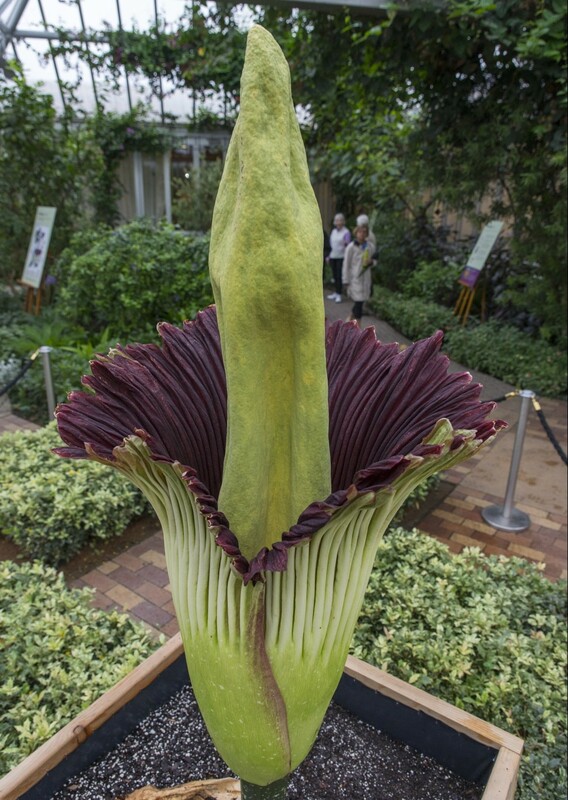 The titan arum’s odor has been described in many other terms as well: rotting flesh, rancid meat, rotting animal carcass, old dirty socks, and even the smell of death itself, which accounts for the plant’s common name, the corpse flower. In its natural habitat on the island of Sumatra in Indonesia, the “fragrance” is used to attract the carrion-eating beetles, dung beetles, and flesh flies that pollinate the titan arum. The inflorescence’s deep red color and texture contribute to the illusion that the spathe is a piece of meat. 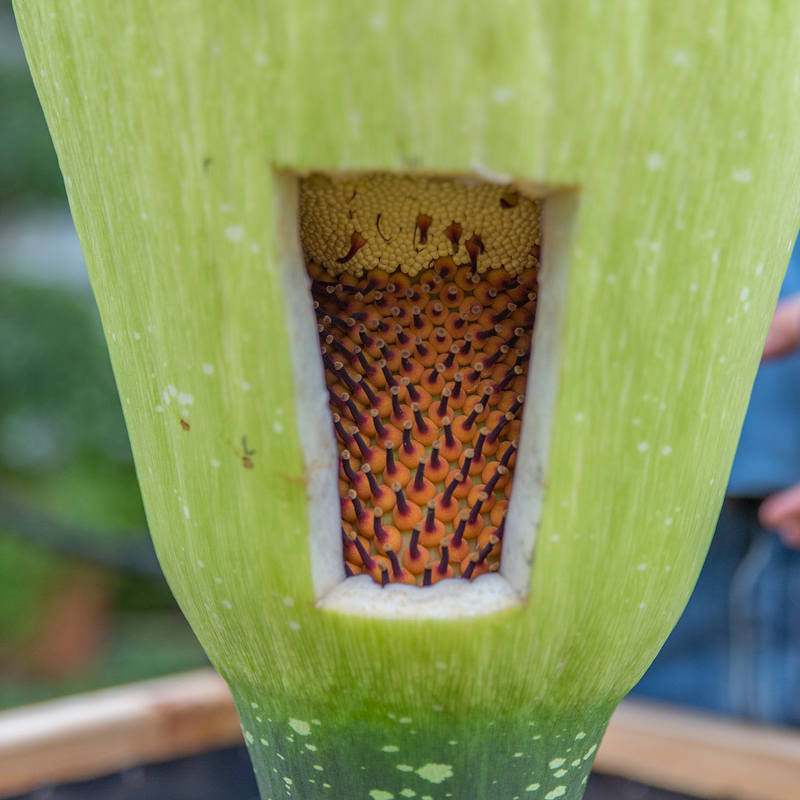 During bloom, the tip of the spadix is approximately human body temperature, which helps the fragrance volatilize (turn to vapor) and travel long distances; the heat may also advertise that there’s a fresh carcass for insects to check out. 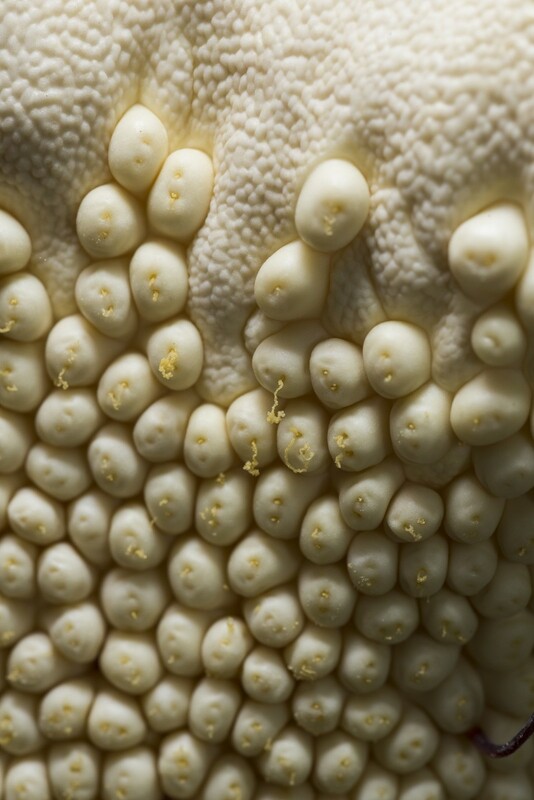 A different view of ewwww! Carrion beetles, dung flies, and flesh flies aren’t responding to the call of the titan arum’s scent because they want to be pollinators—they’re responding because they want a good environment in which to lay their eggs. In the wild, mama beetles and flies lay eggs on dead animals or animal feces knowing that the larvae that hatch will have an immediately-available, rich source of food. In its natural rainforest habitat, the titan arum has adapted to that fact. Over evolutionary time, it has developed the right scent to attract those insects—and, like many scented flowers, to deceive them with scent into acting as the unwitting spreaders of their pollen. Keep checking back for more on Spike’s progress! There’s something very special about this orchid. Can you tell what it is? A native of Madagascar, Angraecum sesquipedale is an epiphyte that prefers the drier branches and trunks of trees as a host. The nectar of this orchid resides almost entirely at the tip of the orchid’s spur. If you guessed that it was the long tubular structure coming from the back of the flower, you are right! 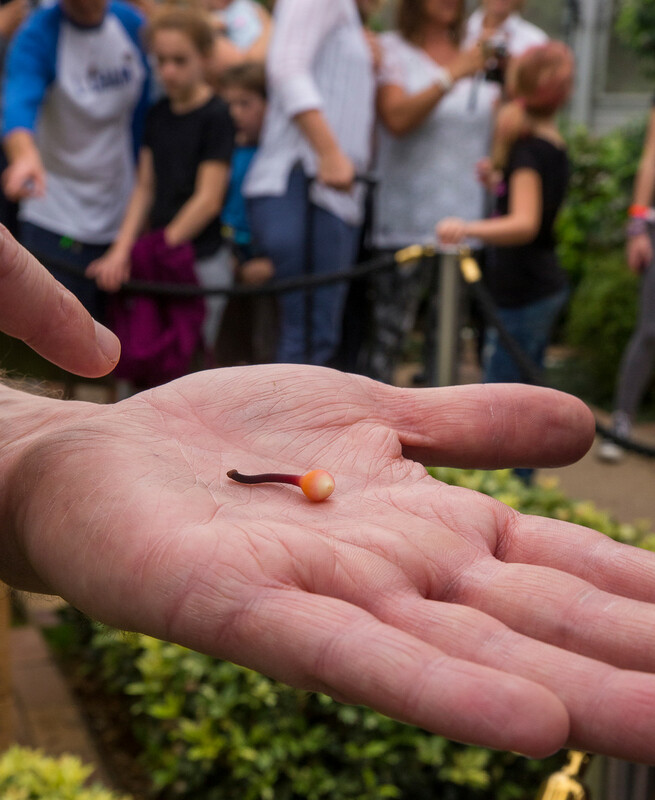 That spur contains energy-packed nectar and is the reason this plant has a place in history. Angraecum sesquipedale was first described in 1822 by French botanist Louis-Marie Aubert du Petit-Thouars and would be shrouded in mystery for decades after. It arrived in the United Kingdom 33 years later. 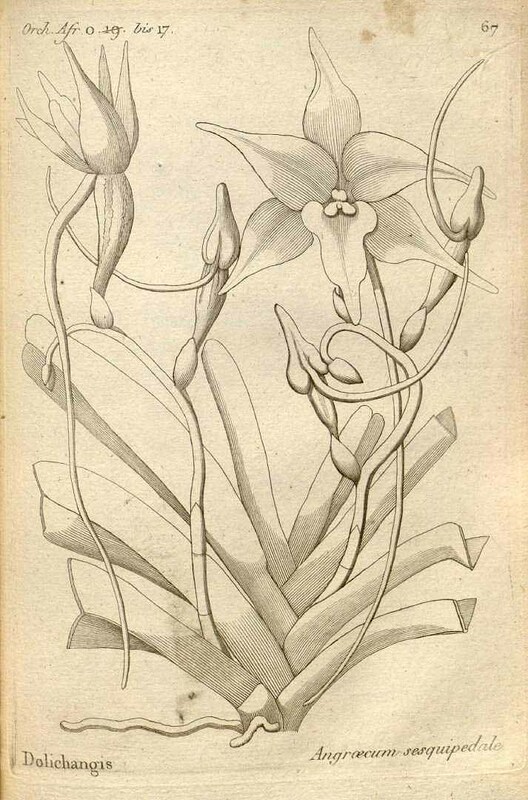 An illustration of Angraecum sesquipedale from Histoire particulière des plantes orchidées recueillies sur les trois îles australes D’Afrique de France, de Bourbon et de Madagascar (1822) . At the time this orchid was discovered, transporting plants from one continent to another was extremely difficult and often unreasonable. The long sea journey, combined with polluted conditions in industrialized cities, made it difficult to collect and maintain specimen plants. This would all soon change. It was in 1829 that Nathaniel Bagshaw Ward discovered the mechanism that revolutionized horticulture and botany forever. Nathaniel Bagshaw Ward was an English doctor who spent most of his life in eighteenth-century London. In his youth, he perused the writings of Linnaeus and spent some time in Jamaica, which fostered his love of entomology and botany. As an adult, Ward was inspired to create a wall of ferns and mosses in his own yard, but failed due to the polluted air of East London. He was distraught. In the summer of 1829, Ward took a glass jar and placed a hawkmoth chrysalis inside, atop a bed of moist leaf mold. Ward regularly checked on the progress of the moth, finding that before it hatched, grasses and a fern emerged from the leaf mold. Ward observed that the glass jar retained moisture because as it warmed up, water evaporated, condensed on the glass, and returned to the base of the jar, never escaping. With this success he repeated his experiment and, to his delight, found that he could keep plants growing within the chamber for years. 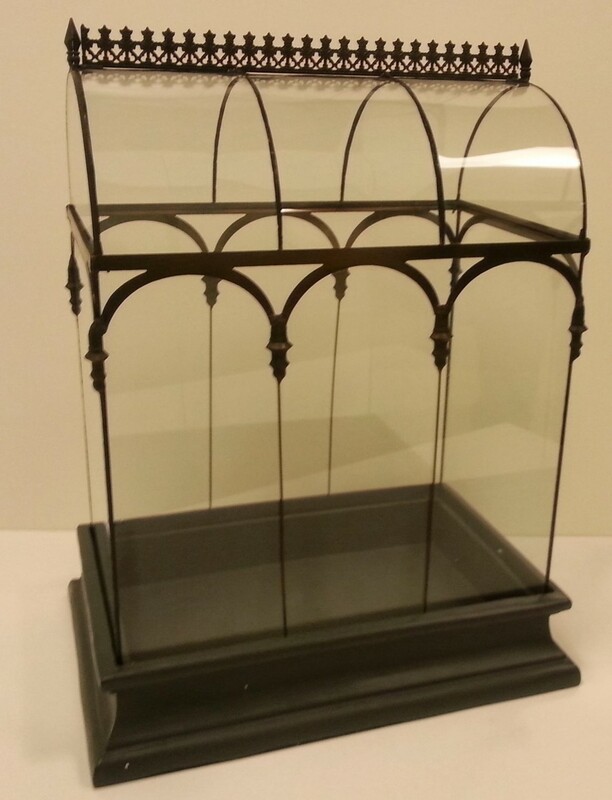 His discovery brought about the invention of the Wardian case, the predecessor to the modern terrarium. He wrote extensively about this in his book, On the Growth of Plants in Closely Glazed Cases. Soon the Wardian case became a popular feature of the parlor in Victorian society. These parlor versions, both tabletop and freestanding forms, often held one or more plants and could be rather ornate. One of four Wardian cases appearing in our Orchid Show this year. Wardian cases like this one could be found in parlors of wealthy Victorians. In 1843, the Wardian case was used for the first time to bring plants from China by sea. The director of the Royal Botanic Gardens, Kew, observed that in 15 years, the Wardian case brought six times as many plants as had been imported in the last century. If you do the math, that means it made importing plants almost 40 times as efficient as regular ocean travel! This was of particular use to collectors like James Bateman, a wealthy landowner who sponsored several plant exploration trips through the Royal Horticultural Society. 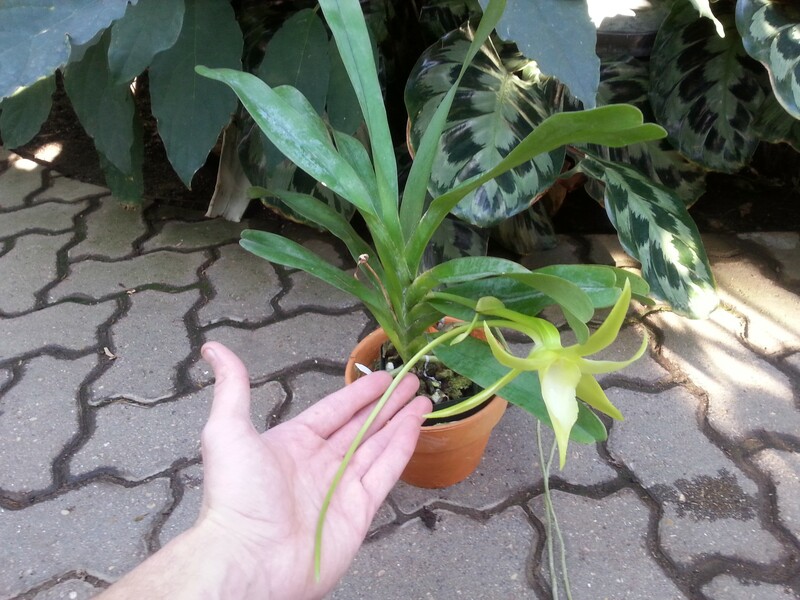 One such trip would bring several rare Angraecum sesquipedale from Madagascar to England, and in 1862, this plant would find its way to one of the prominent figures in history. By 1862, Charles Darwin had already become a prominent figure internationally. Having published On the Origin of Species three years earlier, Darwin was already the subject of scrutiny by religious groups and scientists who disagreed with his theories on evolution and natural selection. In this same year that he received a number of orchids from Bateman, Darwin published his book The Various Contrivances by Which Orchids are Fertilised by Insects, which proposed that Angraecum sesquipedale must be pollinated by a “huge moth with a wonderfully long proboscis” (or straw-like tongue). He proposed that it might be a Sphingidae moth since these are typically large. No such moth was known to exist on Madagascar. Though largely overlooked by the public, his proposal became a subject of controversy, particularly in the religious community. Critics attributed any existence of such a creature to be by divine will and not natural selection; most mocked the possibility of such a moth existing. Others viewed his prediction with skepticism since only smaller moths had been discovered in Madagascar. 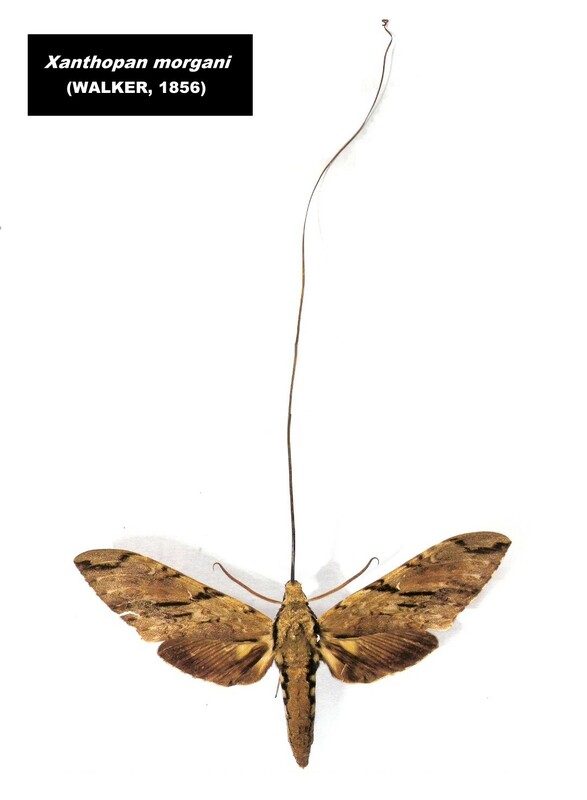 In 1903, 21 years following Darwin’s death, a subspecies of moth known as Xanthopan morgani praedicta, Morgan’s Sphinx moth, was found in Madagascar. This moth has a wingspan of 5 to 6 inches and a proboscis of 10 to 12 inches long. The subspecies name, praedicta, was intended as an homage to Darwin’s prediction that such an insect existed. 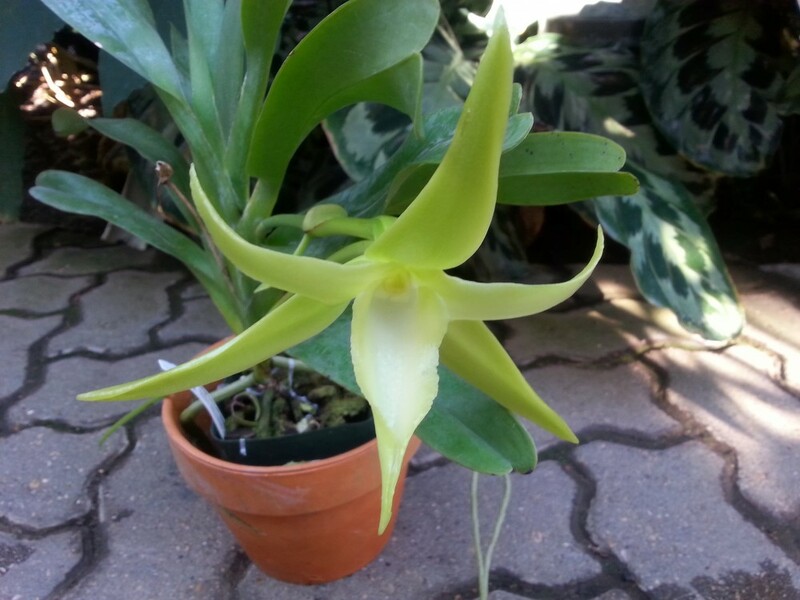 Angraecum sesquipedale, frequently referred to as Darwin’s Orchid, is currently being displayed in the Greenhouse Gallery of the Orchid Show (purchase tickets here) this year.